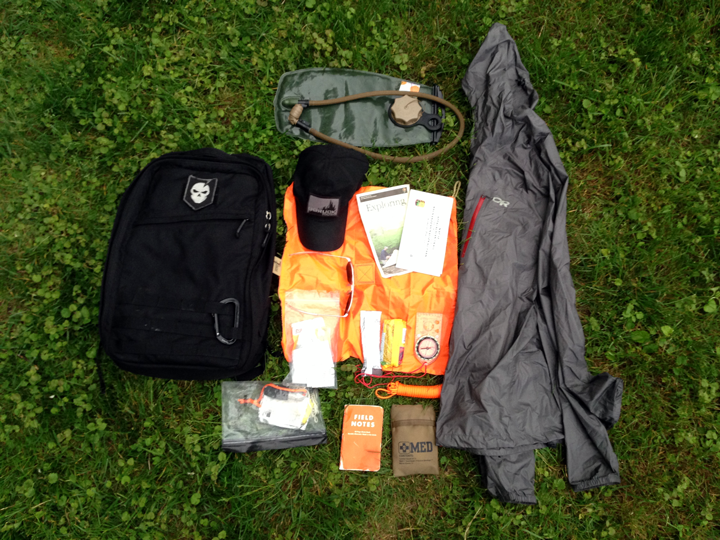 Now that you know what bases you need to cover, here is an idea of what I personally bring on my day hikes. Again though, this varies based on weather conditions but imagine it's a typical summer day. Nothing. I would find natural shelter or build my own. It's worth mentioning again that you should look for clothes that both breathe easily and wick moisture away from your body. Cotton is not a material that does that. Below is a list of what I've been wearing and really liking recently. Outdoor Research Growler Shirt. I really like this shirt because it's technical without looking like it is. Being a blend of nylon and polyester, it wicks moisture away and it breathes really well. Outdoor Research Treadway Convert Pants. They're comfortable in material and movement and zip-off into shorts if things get hot. They also shed water well if you get caught in a sudden downpour. This all depends on the trail. Some day hikes I go on only require running shoes and others are better suited for boots. If I can get away with running shoes, I prefer a pair of Balega low cut socks. I just love how comfortable and cushioned they are. When I wear my Lowa Renegade hiking boots, I'll go with a light or medium weight pair of SmartWool PhD socks. I roll pretty much the same gear. However, living in Tucson I encounter far to many people hiking in the desert summer and winter who didn't go prepared. So I carry several bottles of water, gatorades type mixes, chews and enough energy bars / candy to give away to others. Also ITS Oral IV, a small tarp and paracord to build a sun block. Hey Mike, nice article. I wanted to chime in here since I live in southern California where rattlesnakes are a common sight in the back country. I always carry a snake bite kit. It seems to me that when you're 1.5 to 2.5 hours from the trail head, having to hike out before you can treat a rattlesnake bite is not a high survivability scenario. I also like to carry a whistle for signaling and an air horn because I hear that mountain lions don’t pay much attention to bear bells… for whatever it’s worth. Hey Mike, where do you do most of your day hikes?? I like hitting Great Falls every now and then.